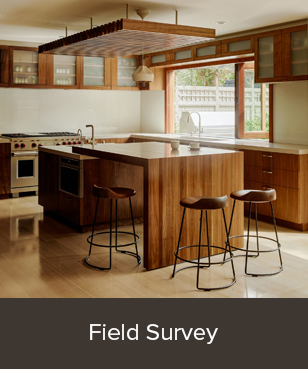 We provide detailed shop drawings and submittals for unique profiles, finishes and hardware. Our drawings detail the fit and function of each assembly, and relate our work to adjacent finishes and structure. We work with several local Finishing shops to define and repeat a wide range of paint, stain, dye and clear finishes. We use grid and datum lines to orient our work in a given space, finalizing our products’ dimensions to fit. We use lasers to survey an existing space or your electronic model to define a future space. We install our own work, referencing the design benchmarks in a given space to ensure that other trades have an accurate layout to work with. We prepare for electrical, plumbing, stone, glass and other elements by providing cutouts, backers, and chases. We build contemporary and traditional cabinets. Our design parameters encompass a wide range of construction and joinery methods. We choose the best method to suit the design vision of each job. 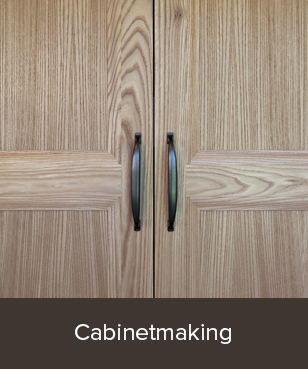 We mortise and attach a wide range of hardware on cabinets, doors and other millwork. We manufacture jigs and templates to repeat detailed mortise-work, and we utilize our CNC router to execute more demanding patterns or processes. We manufacture doors in-house. 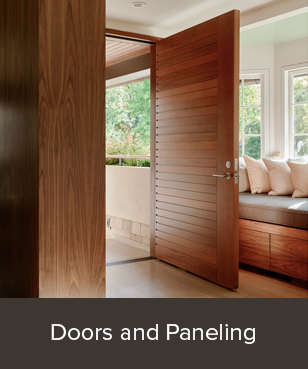 Our door shop builds cabinet doors, entry doors and wall paneling assemblies. In addition to frame and panel construction, our door shop manufactures a variety of core assemblies for our oversized slab doors and wall panels.